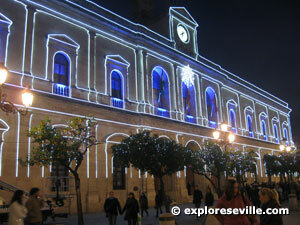 Exploreseville.com: Christmas holidays in Sevilla. 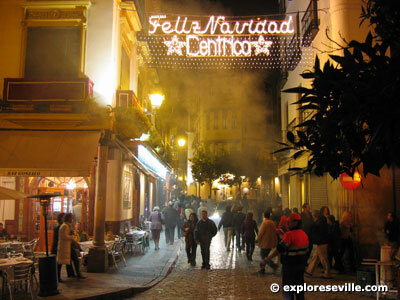 The Christmas holiday in Seville is a festive time! I know many think of cold weather and snow when it comes to the holidays, but I can't think of a better place to be this time of year. From the lights in the center - more than 80 streets and plazas are illuminated this year - to the nativity scenes, chestnuts roasting, holiday markets and crowded shopping districts, Seville puts on quite a show for those of us living in or visiting the city. Then there's the people singing villancicos, or Christmas songs, in the streets and of course the Loteria de Navidad, or Christmas lottery, a tradition for so many Spaniards which includes hours of singing orphans on Christmas day. And the holiday season lasts until January 6th in Spain, so it's a long haul! Like many countries the shopping period is starting earlier and earlier every year. Most people give their gifts on January 6th instead of December 25th, pushing the mad rush of buying into the new year. New Year's, the Día de la Inmaculada Concepción and the Día de Santos Inocentes are other days where you'll see some holiday activity or just a little joking around. Celebrating the Immaculate Conception on December 8th, this is an official holiday in Spain, well, it's shared with Constitution Day. 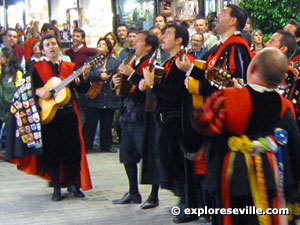 In Sevilla it is best known for the night before on the 7th when los tunos, university student musical groups or fraternities, dress up and head into the streets to play guitar and sing through the night. All end up in front of La Purisima, leaving flowers and taking turns serenading the statue representing the Virgin Mary. Many people flood the streets and gather around the statue before midnight to get a good view of the serenading. The following day there is a service in the Cathedral with children performing traditional dances. Christmas Eve, or La Noche Buena, is probably celebrated more than is Christmas Day in Spain. A large meal comprised of plate after plate of food is prepared for the family starting later in the evening and goes on many hours through midnight. It's a time to be with family and enjoy food and drink. Once the meal is over, traditional holiday sweets such as turrón and champagne help finish off the night. Christmas day is an official holiday and often spent with family while many stroll through the center and may choose to take a break from cooking to eat lunch in a restaurant. While this isn't a holiday in the Christmas sense it's worth mentioning for it's joke factor. This is the equivalent of April Fool's Day in the States where people pull jokes, or inocentadas, on other people. Television, radio and newspapers join in the fun publishing fake stories on less significant events such as sports or entertainment. New Year's Eve is another night often celebrated with a big dinner with family at first and then a night out at a party. Many bars and restaurants have private parties where you pay a certain amount for food and drink, including a bottle or glass of champagne. Grapes are often consumed as well - one for each chime of the clock at midnight - that's 12 total! 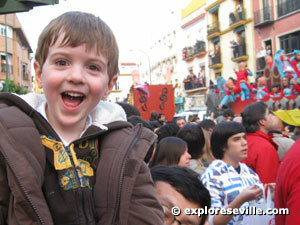 Many gather in Plaza Nueva to watch the clock, eat a lot of grapes and then head to parties around town. New Year's Day is an official holiday and most people spend it recovering from the night before. This is the day of presents much like the 25th in the states or other countries. Celebrating the day the three kings came to visit the niño Jesus with gifts. Children write letters to the Reyes Magos asking for gifts. Hanging stockings, or calcetines to be filled with candy is becoming a common practice, but leaving your shoes or slippers out to be filled is still the Spanish tradition. It seems everyone spends the night before watching the Cabalgata de los Reyes, a large Christmas parade in the center, or a smaller version in their neighborhood or pueblo (see below for more info). The three kings come in the early morning and leave presents for the children, and if you're lucky, the adults, too. Traditional baked goods, such as the rosco de reyes are consumed and many children will be seen in the parks with their new toys! 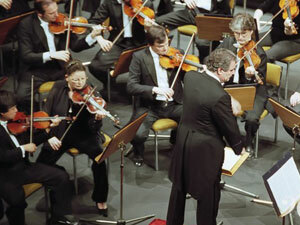 Below are concerts which are held every year and are holiday traditions so to speak. There are always more concerts depending on the neighborhood something may be closer to you. For more popular villancicos (typical holiday songs) keep an eye out in the center as the holidays near. There are often groups who go from plaza to plaza singing a few songs. For the concerts below most dates are not set until closer to the holidays. My indications below are some approximations until publishing of the official schedules. Occurring on the night of the 7th of December I briefly mentioned this above as well. While not a parade the groups play music and many can be seen serenading various women and men (there are now female tunas!) in the center before heading to the statue of the Virgin next to the Cathedral. This exists in many forms on the 5th of January. Much like a Christmas parade back home, the Reyes Magos and the children who accompany them on several floats, throw candies to the children (and many adults) as they pass through the streets in a procession. There are many to see, but the largest is the official procession which runs through the center of the city as well as parts of Los Remedios and Triana. Then there are the cabalgatas organized in many of the neighborhoods such as Nervión. Watch out for the mean children who throw candy as hard as they can, hoping to break something (such as your nose or glasses). In smaller towns I've seen them throw anything from small toys to olives (packaged) and more. Another likely sighting in the center and various neighborhoods are the Royal Postmen who take the letters the children write to the Reyes Magos. Accompanied by a band playing music, you'll generally see between the 27th of December and the 3rd of January, depending on the neighborhood. In the center the date is normally closer to the 3rd of January. 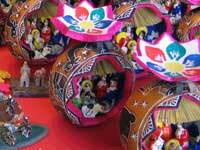 In general you can see a belén or a nacimiento just about anywhere in Seville during the holidays. Just look for the signs posted around the center and follow the arrows. These often lead you to larger scale and nativity scenes put together by sponsors and foundations, as well as some impressive ones created by stores such as El Corte Inglés. Churches and other private belenes are also located throughout the city. And keep your eyes open for store fronts, especially the bakeries who come up with some pretty interesting edible creations. In recent years there was also an incredibly detailed chocolate nativity scene complete with Seville landmarks, although you would have had to traveled to Cordoba to see it. Many take just a few minutes to see while the larger ones are well known and you can expect lines and a wait to view them. A few recommendations are below to see some of the best scenes in the center. All will run until about January 5th unless otherwise noted. You can also wander around the center and look for lines of parents with their children. They are almost certain to be waiting to see a nativity scene! : Plaza San Francisco or c/Chicarreros just off of the Plaza. : Ayuntamiento, between Plaza San Francisco and Plaza Nueva under the arch, this is the official Town Hall nativity scene. : Plaza del Duque often set up to the right of the main building, or at times in front by the main entrance. : c/Laraña a few blocks from La Campana, you can often see the lines of children with balloons from La Campana. : Calle Santa Paula, 11. In the Macarena neighborhood in a zone with several churches and convents. : Calle Orfila, 3. In Just a few blocks from La Campana and calle Sierpes. : La Campana Bakery at the end of Sierpes almost always has a little nativity scene made from chocolate and some kind of sugar to keep things together. : most of the Horno San Buenaventura locations often feature something interesting in their display window. Again, there are plenty more to see in most any neighborhood. Keep your eyes open! From mid November until a few days before Christmas, this market supports a tradition throughout Spain and certainly in Sevilla, that of the belén, or nativity scene. Now is the time where people purchase the figures and scenery either for a new or to add to existing belenes. Take your choice from the most famous stores in Sevilla and Spain which sell these items in display booths, normally in the Plaza de San Francisco, but this year it has moved to around the Archivo de Indias. Figures range from the serious to whimsical and from a few Euros to hundreds of Euros - this is a serious business! Christmas ornaments, cards and other decorations are available as well. From mid November until early December you will find a gathering of local book merchants selling old and rare books, plus some normal more recent books. There are some interesting titles from the Ayuntamiento, including several published titles about history, art and architecture of Sevilla. Comics, old newspapers as well as a few antique and replica posters and photographs. From mid December until early January, local artisans and craftsmen display their goods for sale in this annual market in the Plaza Nueva. From pottery to paintings, jewelry and more you can find gifts that are uniquely Spanish and Sevillan. This is perhaps my favorite place to shop for gifts. I always find something original and at a decent price in this market, which is conveniently located at the edge of the main shopping district. During the first week of December, if you want to see the demand for sweet things then simply get in line at the Alcazar (Patio de Banderas) for the Exposición de Dulces from the local convents. You need to get there the first day and early if you can, because the best baked goods and sweets are taken quickly. The line on Saturday's can extend several hundred meters. If you can't stand the wait you can hit a local convent or head to the Plaza del Cabildo just off of Avda. Constitución where there's a small store which sells a good variety. As always there are the local markets which you can check out every week for holiday shopping. As for dinner both on the 24th and the 31st it will vary greatly from family to family. A few foods which make it to most holiday tables are jamón serrano and other chacinas, or cured meats, as well as manchego cheese. Olives and capers are generally the first thing on the table. Having spent an entire day last year driving in the province of Huelva through Jabugo and Aracena we witnessed a large number of people traveling from the cities to buy some of the best jamón and chacina you can find. 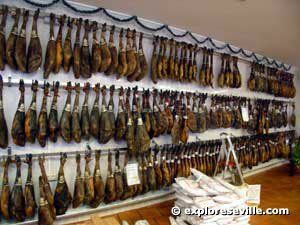 If you find yourself in Aracena you may also want to make time to visit the Museo de Jamón, dedicated to the delicious cured ham which comes from the Iberian pig. Our dinners often include langostinos (prawns), carillada (stew) and perhaps fried fish of some sort. We've enjoyed mejillones rellenos and honestly nobody can compete with my suegra's recipe. They could try, but ...these are mussels which are chopped up and mixed with things like hard boiled egg, a little bit of bread crumbs (I think), and some garlic but I'm not allowed to publish much more ;). This is all chopped up and mixed together then stuffed into the half shell and fried. Other dishes are sopa de mariscos (shellfish soup), carne mechada (roast pork) or carne mechá as they often say it in Sevilla. For drinking there is no typical beverage like eggnog, although you'll find a little of everything out during and after the meal: red and white wine, mosto (a wine typical of the fall and winter season), beer and cava, the Spanish version of the French champagne. Eating the 12 lucky grapes or uvas de la suerte, at New Years is also a tradition. You should begin at the first strike of the bell before midnight and then race to eat a grape each second until the new year arrives. And I thought I would add a quick note for Thanksgiving dinner. If you don't find yourself in the mood to prepare a big dinner or find yourself in an apartment which doesn't have an oven (more common than you may think), you may consider a few of the places in Seville which cater to us lonely expats on this holiday. Those include the Texas Lone Star Saloon, Flaherty's, Restaurante Nueva Victoria or Casa Carmelo in Santa Cruz. All of these have had special Thanksgiving dinners in the past and in most cases it is recommended to reserve ahead. 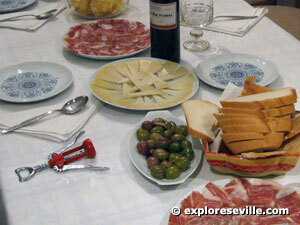 If there's one thing you can can't on it's eating well during the holidays in Sevilla. As I mentioned above the traditional Christmas day cake is a rosco de navidad, which is a sweet, round cake with a hole in the middle. Topped with candied fruit and filled with cream (and sometimes chocolate cream) the tradition is to hide a little figurine inside the cake. Then you hope to be the lucky one who finds it! I used to find them a bit dry and was not a big fan until I found a good place to buy them. A note to vegetarians: often the cream filling is made with lard. Turrón is also a favorite and if you make your way to El Corte Inglés or another supermarket the selection is so big it's almost scary. Several aisles are converted to turronlandia (land of turrón) and on many years they also have a little specialty stand where they will cut you a piece to order. It's said the average sevillano consumes 25 kilos of turrón in just a few weeks...ok, perhaps that is far from factual. But you would think its the case by the amount of turrón available on the shelves. Aside from turrón there are plenty of other candies and cakes you can choose from. More traditional holiday sweets include polvorones and mantecados, with the best coming from the nearby town of Estepa. During Christmas this small town becomes the mecca for these types of sweets. You could visit several factories and some smaller, more artisan operations where they are carefully hand crafted. Polvorones and mantecados have become quite famous and are distributed throughout Spain as more recently internationally. And the folks from Estepa have learned to set up shop in Seville. There are several locations, perhaps the easiest is from "La Colchona" on Calle Cuna, just a few blocks from the Plaza Salvador. For some ideas on where to buy other types of pastries, sweets and all sorts of confections you can check out my list of bakeries in the food section. While the local convents make plenty of sweets year round they are in high demand during the holiday season. The above mentioned exposition of convent goodies is one way to find them. Beware of long lines during some hours. You can also find them in the Plaza del Cabildo and the Santa Justa train station. But you miss out on all of the fun in visiting a local convent and taking a little trip back in time. So below I've listed some local convents and a few of their specialties. A few blocks from the Alfalfa at the end of Calle Boteros. Specialties: Yemas de San Leandro, a gooey, sugar-infused, candied egg yolk. Located in Triana. Specialties: a variety of special holiday confections. Two blocks up from the Plaza Encarnación, this convent is located close to Rayas, another recommended stop for something dulce in the way of ice cream. Ok, so Rayas will likely be closed in the winter months! Specialties: a variety of special holiday confections. Specialties: Tortitas de aceite (thin, sweet and crispy fried cakes in olive oil). Others included: bollitos de Santa Inés, cortadillos, roscos and more. Visiting the convent should be on your list of things to do even if you don't buy sweets! Specialties: To the regret of my waistband my personal favorite is tocino del cielo, which translates into "fat of the heavens". Think of flan but thicker because its made with twice the egg yolk. Also close to 20 different types of jams and jellies. The list is long, specialties include anything with marzipan. 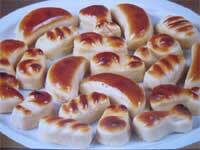 That's maybe my personal preference but the dates filled with marzipan are terribly addicting. I still need to try the bienmesabe, which means "I taste good"
My first apartment was on this street in Santa Catalina but I never tried anything from the convent until moving away. 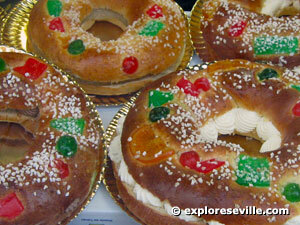 A shame as I could have enjoyed a short walk to pick up my rosco de reyes. Specialties: I would start with the pestiños, fried, crunchy dough coated in honey. If you like coconut try the delicias de coco. There is plenty to choose from but again I drift to marzipan. This time with pine nuts ..something curiously good about this combination. Just a block from the Cathedral although hidden in the Plaza del Cabildo. 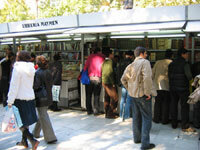 On Sundays there is a market for stamps, coins and other collectables. 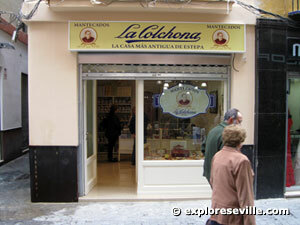 The store brings together some of the specialties from the convents above. If you are visiting Seville during the holidays in general it should be easy to find an open restaurant for a special meal. There should be many open restaurants and bars even for the 25th and 31st of December as well as the 1st of January. When in doubt stick to the area around the Cathedral and in Santa Cruz. These are popular areas for tourists so you're much more likely to find something. The most difficult date will be Christmas Eve (24th of December). This night is especailly important to spend with family so almost all of the bars and restaurants will be closed. Hotels with restaurants often will have a meal planned but it is best to check with them in advance. In general this will be in four star or higher category hotels. There are a few restaurants which will remain open on this night which I have listed below (there are certain to be a few more). However, this is not a night to decide at the last minute to find a place to eat and at the same time be very picky about it. If you don't reserve in advance or at least have a plan you may find yourself going hungry or eating in a pizzeria. But don't panic, you can also cover your bases by inquiring earlier in the day to see who may be open. Most of these you will find in the immediate area around the cathedral, or just a few blocks away. Spending the holidays in Sevilla is wonderful, but you may find yourself missing some of the traditions back home. With a little work and knowledge you can recreate some of those traditions as we've done. While not always the same we've managed to celebrate both the "American" Christmas and Spanish Reyes without too many problems, other than a large turkey dinner on the 25th, after just having stuffed ourselves the night before. Trees are becoming more and more common but most Spaniards buy the plastic variety, of which there are many to be found in El Corte Inglés and other stores. To get a real tree it's best to check with a floristeria where they often have a couple tucked away somewhere. Unlike in the States these are already twined up and ready to take home. This leaves you guessing about the state of the tree's fullness. Trees also generally come "roots and all" and instead of buying a tree stand you buy a pot, or maceta, and a little soil and plant the tree. The floristeria in the Alfalfa sells trees as does the one on Menendez y Pelayo close to the Puerta Carmona. Another location is Floristeria Manolo close to the market in the Encarnación. Honestly the trees often look like the Charlie Brown variety with much left to be desired for height and fullness. But if can buy one and drag it through the center you can also enjoy the locals curiously looking at you on your way home. As happened to me one year: a nice fellow took the trouble to come out of the bar where he was drinking to remark "Mira el americano con el pino!" You can find the most decorations and ornaments in El Corte Inglés in the Magdalena on the basement level, although most are fairly ugly in my opinion. La Yunta, relocated on c/O'Donnell, had a lot of ornaments and decorations and some of the more tasteful some items were quite expensive. However they have closed and we miss them dearly for a few things. Casa, just on the corner of the Plaza de la Gavidia, also has some ornaments as well as plenty of holiday theme decorations. In general they are quite cheap. We've had luck in random home decoration and accessory stores as well as a few of the dollar type stores which you'll find here and there in the center. Over the years it has become easier to find ornaments and lights. Having an oven might be the most of your worries when it comes to a traditional Christmas dinner. Depending on your family the favorite dishes may vary, but we've had no problems repeating the tradition with turkey, stuffing, mashed potatoes, sweet potatoes and a host of vegetables. A good pie can be made or you can simply replace it with a tarta from a bakery. If you are looking for cranberry sauce, it can almost always be found in El Corte Ingles supermarket. If we buy a turkey it is generally in El Corte Ingles as well but almost any carniceria (butcher) can get one on order if they don't have one on hand. Shopping for gifts is quite easy in the center. Intermon, which just relocated to calle Muñoz Olive, is a place that will make you and the person you give your gift to feel good. Local art, accessories, jewelry, food and more from countries and people in need. All goods come from areas and shops where they have certified the working conditions and pay to be of good standards. They make sure the money you spend goes back into the hands of those who make it. Aside from that the items are unique and reasonably priced. Really cool stuff here! I often make my way through the markets in Plaza Duque, and Plaza Magdalena. 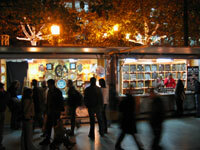 When open the Feria de Belenes in Plaza San Francisco and especially the Mercado de Artesanía in Plaza Nueva (both listed above) are great places to get something original or holiday ornaments for gifts. The Mercado de Artesanía is nice if you want to find something original. On sale are almost exclusively handcrafted items from Spain. 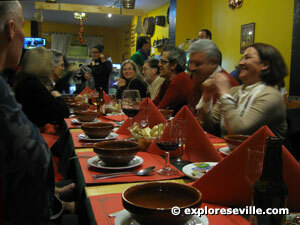 We also often go to Casa in the Plaza de la Gavidia when looking to find a few last minute gifts. Venturing further out to Triana you can find some great little ceramic shops behind the market which offer lots of great typical gifts at a decent price. Shipping those gifts abroad is quite expensive, so you may have to get your shopping done early or as we do many times order online in the U.S. and have things shipped directly to our relatives. While they may miss out on the typical gifts from Sevilla it will save you a bunch and gives them an excuse to come visit you. Or you can cheat and order something from tienda.com which has already been exported so you save a lot on shipping! For more gift ideas check out the shopping section.